Ulster County is in the heart of New York State’s fertile Mid-Hudson River Valley. 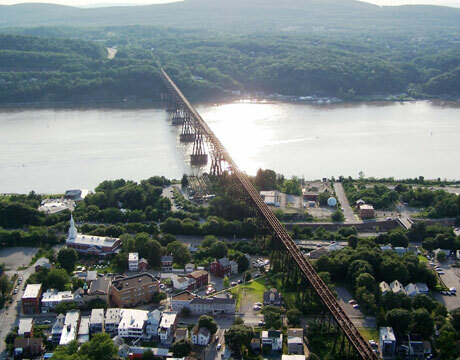 With the Hudson River flowing along the county’s eastern border, Ulster is ninety miles from New York City on Interstate 87, an hour south of Albany, and approximately equidistant from Boston and Philadelphia. Nearly a third of Ulster County, over a quarter million acres, is the Catskill Park and Forest Preserve, a federally protected forest preserve. I n the foothills of the Catskill Mountain Range, Ulster is known for its beautiful views and spectacular scenery. 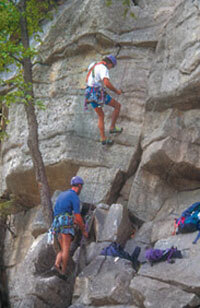 With its 35 mountain peaks, the county is a popular destination for rock climbing. The New Paltz area has some of the best, sitting onhe edge of the Shawangunk Ridge. New Paltz is also the home of the State University at New Paltz, and of the oldest street in America.The county’s 355 miles of hiking trails also contribute to it’s outdoors reputation. Also famous for pedestrians is the Walkway Across the Hudson, a footbridge that spans the Hudson from Ulster to Dutchess Counties. The town of Phoenicia in the Esopus Creek mountain region is famous for fly fishing. A few miles west of Ulster County, the spectacular Bethel Woods Center for the Arts on Woodstock concert grounds features world-class live concerts on its outdoor stage. Acts from opera to doo-wop appear throughout the year. Kingston was New York’s first state capitol, and still offers visitors superb dining and shopping on its Rondout waterfront area. Likewise Saugerties, also on the river is known for its fine antiques shopping center. There are many quaint and wonderful towns and villages in Ulster County, and many things for residents and visitors alike to enjoy. While Ulster may be known for its spectacular scenery, it is also the center of arts and culture in the Mid-Hudson region. From galleries and museums to music and theatre to casual concerts on warm summers evenings, Ulster is home to a surprising variety of culture. The famous artscape of the Opus 40 installation is typical. Built over a period of 37 years by Harvey Fite, one of the founders of the Bard College Fine Arts department, this monolithic structure of millions of fitted blue-stone slabs is one of the truly marvels of outdoor sculpture. Of course it wouldn’t be cultural without music, and music is alive all over Ulster County. From the Woodstock concerts to shows at the Ulster Performing Arts Center to community music-in-the-park nights all summer long in towns and villages throughout the county. 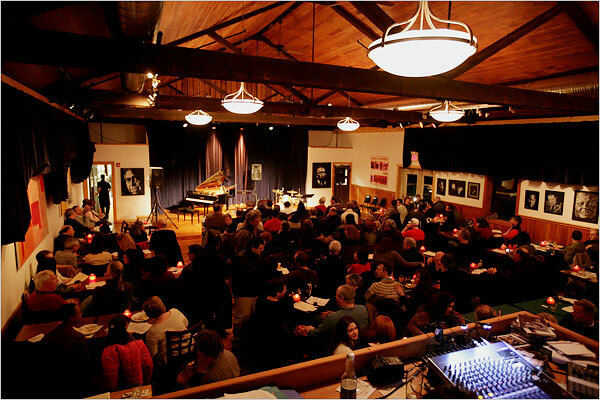 The Falcon jazz center in Marlboro has been a part of the New York City jazz scene since it was built in 2001 by jazz musician Tony Falco. The venue regularly hosts an amazing list of today’s jazz greats and upcoming stars. The Bethel Woods arena and museum is a huge venue, built on the site of the 1969 Woodstock outdoor concert. Top acts and musical stars of all genres of music perform there in a unique open air auditorium. hristina Varga showcases the work and performances of self-taught, outsider, emerging and visionary artists. A more traditional gallery, the D.M. Weil Gallery in New Paltz offers abstract paintings and contemporary artworks for sale, in a beautifully light and airy setting. And don’t miss the wonderful arts and crafts fairs in New Paltz and around the county. These summertime events bring out an amazing variety of work, from kitch to classical. Things to See and Do (see links below for more information) Visitors and residents of Ulster County have plenty to keep them busy all year long. The hills and forests throughout the area play host to thousands of hikers,rock climbers and campers in the summer, and skiers, ice climbers and mountaineering enthusiasts in winter. Rock climbing lessons are offered to the uninitiated by companies like Alpine Endeavors, which offers instruction and guide services to climbers of all levels. With its proximity near the Hudson, all kinds of water activities are available. Boat tours and charters can be found in Saugerties, Marlboro, New Paltz, Rosendale, and especially Kingston where six companies offer charter service. Sail on board the 36-foot Catalina “Black Swan” out of Saugerties, or take the 75-seat cruiser “The Teal,” or the three-hundred seat “Rip Van Winkle,” out of Kingston. Fishing on the river or in Ulster’s many streams is popular and very accessible, with guides and charters for river fishing, and a wealth of parks for fly-fishing trout in area creeks. If you prefer to voyage inland, take the Catskill Mountain Railroad tour of either Kingston along the Hudson,or the Esopus Creek trail out of Phonecia Station. It’s a relaxing way to enjoy the area’s lush countryside and spectacular vistas. Plan customized tours with Hudson Valley Traveler Services, a tour planning service which can schedule and conduct tours of wineries, scenic trips, kayaking, a cheese and chocolate tour, even honeymoons. Golfers love Ulster for its fourteen golf courses, public and private. The Rondout Golf Club in Accord offers a challenging eighteen holes, 6500 yards from the tips and some wickedly undulating greens. Robert Trent Jones designed the nine hole course at Honors Haven in Ellenville. You can play 27 holes in Highland at Apple Greens Golf Course. Fancy a bit of the grape? 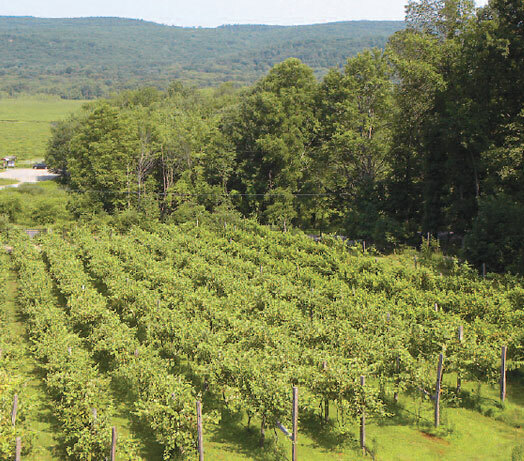 The Hudson Valley is the oldest wine producing region in the nation. Fourteen wineries and breweries operated year around making the perfect liquid complement to the area’s fresh foods.Package tours of the wine trail are available, or you can venture out into the countryside for a great meander through the countryside. Wineries and breweries offer samplings of their wares, local foods and cheeses. 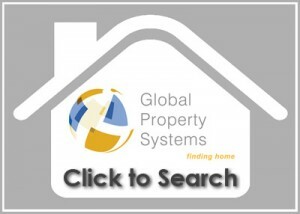 Check their schedules for special events, live outdoor music, fairs and festivals. Ulster County’s farming tradition provides the freshest foods to area restaurants, creating a wellspring of creative options for diners. In almost any town, tables serving elaborate meals to simple, rustic fare can be found, There is a constant influx of culinary innovations happening here. Ulster “foodies” find themselves at 36 Main in a hip, cool atmosphere in New Paltz. New York style barbecue is alive and well at chef Jeremy DuBois’ “All Smoked Out Barbecue and Grill,” in Kingston. But the highest Zagat-rated place in Ulster is the Aroma-Thyme Bistro, a “green-certified” restaurant with innovative, healthy food and an incredible wine and beer list. Jazz every Thursday, music every Saturday. Does it get any better than that?